Wonderful Michigan wines produced in "tuscan" style wineries. Sue loves Michigan wineries. Her she is with Mr. Ciccone ... Madonna's father outside his winery near Suttons Bay. The majority of Michigan wineries are located in the northwest corner of the lower peninsula, and for a good reason. The Ice Age blessed this Michigan area with the perfect blend of climate, soil and terrain. This results in a cooler spring and summer, and a warmer fall and winter. It all adds up to assorted regions, and many micro-climates, that allow a wide variety of grapes to be grown by the wineries of northern Michigan.. This area has exploded with award wining wineries in the last 15 years and the growth is expected to continue. The wineries in this northern Michigan region accounted for six of the top ten Michigan wineries in sales last year. You will find more than 20 northern Michigan wineries on the Leelanau, andOld Mission Peninsula. Fact is, the majority of Michigans wineries are located in the majestic Grand Traverse Bay area. 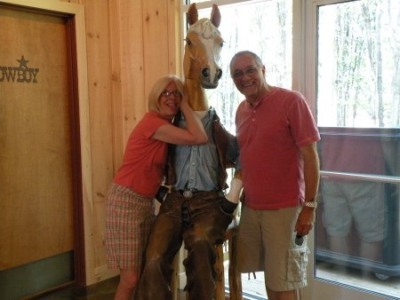 Here we are goofing off at 45 North Winery on Leelanau Peninsula. Many of these Michigan wineries are nestled in the rolling hills with spectacular views of the east and west bays. 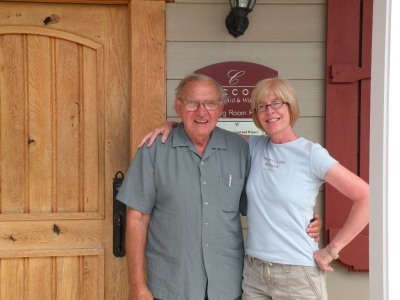 Special Note: The Ciconne Winery on Leelanau peninsula is owned by Madonna's father. They offer a special "Madonna" series of wines that many consider collectible. As you will see from the map below, this area is one of the most beautiful in the country. The Michigan wineries in this region have won hundreds of awards in recent years giving them "world class" recognition. Sweet, dry, whites or reds, no matter what your wine preference, you are sure to find something you'll enjoy. 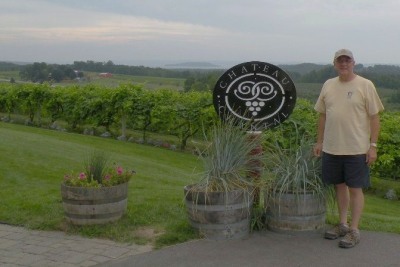 Chateau Chantal Winery on Old Mission Peninsula has amazing views of East and West Traverse Bays. One of the Michigan wines you will want to experience is the "Ice Wine" ... a special desert wine produced by letting the grapes freeze on the vines before processing which is usually done in January. This wine is super sweet so not a favorite of mine but Sue loves it! The Traverse City Airport serves United, Delta, Northwest, and American Eagle airlines. 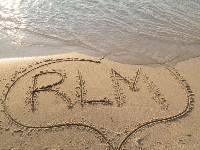 With so much to enjoy, this area is an amazing vacation, honeymoon, or romantic getaway destination you must experience. Tell Us about your favorite northern Michigan winery. Below are some of the wonderful wineries in northern Michigan. You can also visit the Black Star and Chateau Chantel on our Northern Michigan honeymoon page. Leelanau Cellars is the second oldest winery on the Leelanau Peninsula. The Jacobson family began producing wine in 1977 and last year was number one in sales in the state. Their Pinot Noir, Chardonnay, and Reisling are all very popular award winners. They also produce an incredible "Ice Wine" that won a Double Gold award at the 2005 Michigan Wine and Spirits Competition. The Ciccone Vineyard and Winery is also located on the Leelanau Peninsula. Owned and operated by "Madonas" father, you have to check out their "Madonna" series of wines which many consider collectable. No modern processing equipment here. Mr. Ciccone believes that to have the concentrated flavors that the discriminating wine lover appreciates it must all be done the old fashion way ... by hand. All the wines are made from estate grown grapes, planted, and lovingly attended to by the family. The drive into Old Mission Peninsula is simple awe-inspiring. Imagine rolling hills covered with lush vineyards and orchards, and panoramic views of Grand Traverse Bay to the east and west. are located about halfway up the peninsula. Being situated on the 45th parallel the cooler climate allows them to produce expressive varietal wines. The old family horse barn has been converted into a beautiful tatsing room. Here you can sample and purchase their award winning Pinot Grigio, Chardonnay, Reisling, as well as their estate grown Merlot and Cabernet Franc. 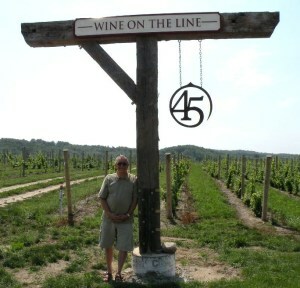 45 North Vineyard & Winery is located east of Lake Leelanau on E. Horn rd. The 45th parallel runs through the 37 acre vineyard. Their new tasting room by Beam Barns LLC, will add to the experience and enjoyment of their award winning wines. Gill's Pier winery was founded in 2002 by Kris and Ryan Sterkenburg. The Sterkenburg's relocated from Milwaukee Wisconsin with a dream to grow grapes and start a family-owned boutique winery. Kris runs the tasting room and is in charge of the daily functions of the business, Ryan is the vineyard manager, and the whole family works in the vineyard including the children, Samantha and Jacob. Gill's Pier Vineyard and Winery can be found near Northport. 2Lads Winery is located on beautiful Old Mission Peninsula. Bel Lago Vineyard & Winery overlooks Lake Leelanau and Lake Michigan. The Mackinaw Trail Winery has tasting rooms in Mackinaw City and Petoskey. You'll find Shady Lane Cellars near Suttons Bay. Peninsula Cellars is another Old Mission Peninsula winery. Brys Estate is located on Old Mission Peninsula. Chateau Leelanau is another winery near Suttons Bay. Left Foot Charley is located in Traverse City. L. Mawby Vineyards is located near Suttons Bay. The Grand Traverse Bay area is "the place" to enjoy Michigan wine!